That’s a prevalent myth in the bar world. 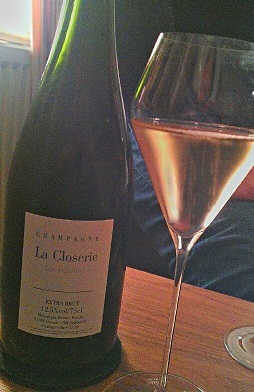 It was during a small tasting round with Klaus St. Rainer that we decided to put the myth to the test. Klaus St. Rainer, a famous Munich bartender, gave us the unique opportunity to taste his rare bottle of Chartreuse Verte, which had been bottled sometime between 1878 and 1903. The basic characteristics of Chartreuse Verte were unmistakable to the nose and palate, but surprisingly they were complemented by a note of curry (probably fenugreek seeds) and an unmistakable touch of absinthe. 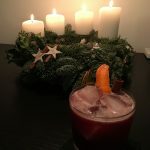 A few months later, I had an internship in “Drink Analysis” at the Chair for General Nutrition Technology of the Center of Life and Food Sciences Weihenstephan as part of my degree in food technology. Over the course of the internship, we worked with a variety of techniques, including gas chromatography. Gas chromatography enables the separation of volatile compounds in (drink) samples, allowing for their qualitative and quantitative analysis. I soon got the idea to use gas chromatography on the historical Chartreuse bottle and compare it to a current vintage, to allow for an analytical comparison. Our internship supervisor, Dr. Thomas Frank, agreed to supervise our Chartreuse experiment, and when Klaus St. Rainer said that he was willing to donate 50 ml of the precious liquid to our worthy cause, we had everything we needed to put a legend to the test. Sample in hand, our team crowded around the gas spectrometer on November 6th 2013. As already said, gas chromatography only allows the analysis of volatile compounds (everything that easily evaporates – alcohol, esters, acids, etc.) These need to be first separated from nonvolatile compounds (for example sugar). We accomplished this by means of water distillation. During water distillation, steam is introduced into the test liquid, carrying substances soluble by water steam into a graduated flask. This method is both time efficient and preserves the substance being tested. It should nevertheless be kept in mind that steam distillation is less accurate than a liquid-liquid extraction or a vacuum headspace extraction. However, we couldn’t consider these methods because of time constraints. 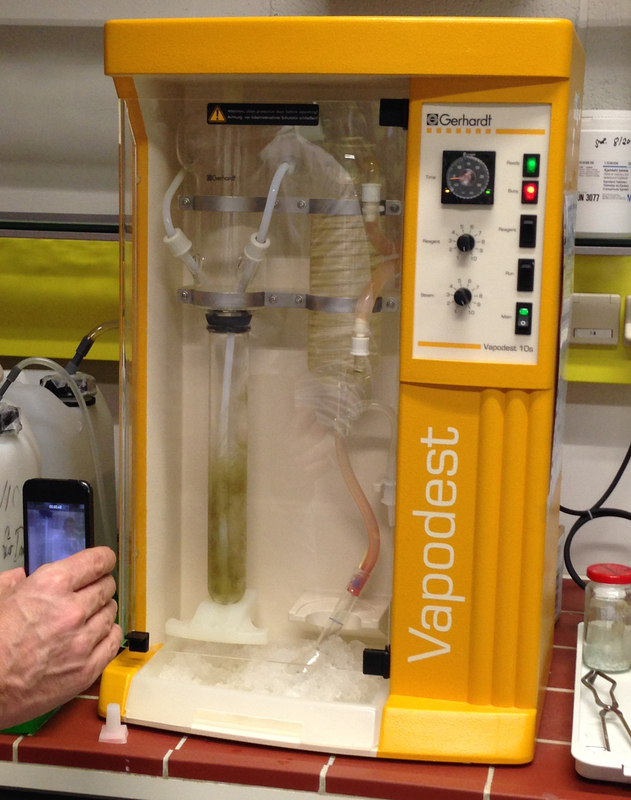 The two distillates (old Chartreuse, current Chartreuse) were examined on the following day by Dr. Frank and his colleagues using gas chromatography-mass spectrometry (GC-MS). For the sake of understanding the following chromatograms, I’d like to provide a brief explanation without going into too much detail. 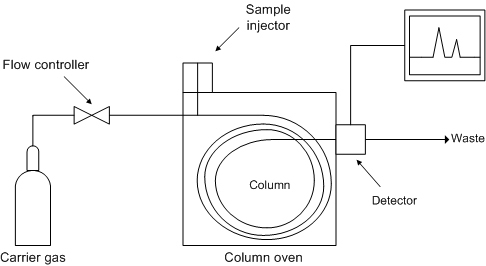 Every chromatography is a separating process based on dividing a mixture. The mixture is dissolved in a fluid or gas (mobile phase), which carries it through a structure holding another material called the stationary phase. The substances in the mobile phase are passed through the stationary phase and through reactions with the stationary phase are seperated and are finally made visible. A few of you might remember this method from chemistry class in school, where the individual colors of a black felt marker can be separated using filter or blotter paper. Gas chromatography works in basically the same way. 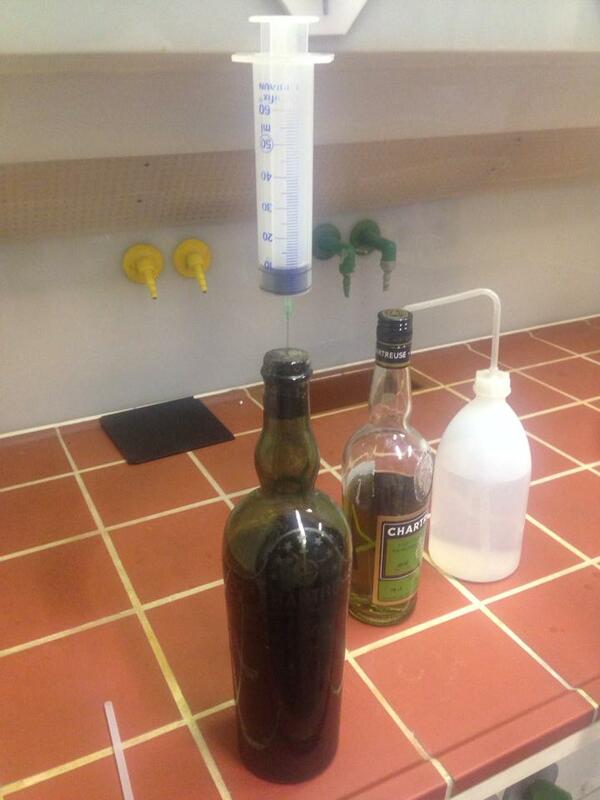 The sample is mixed with a solvent, which is injected into the GC’s intake using a syringe and exposed to a vapor. The vapor consists of a stream of gas consisting of a carrier gas (for example nitrogen or helium = mobile phase) and flows through a capillary separation column. This capillary separation column often has a diameter of 3-6 mm, is between 10-200 m long and contains the stationary phase (often viscous silicone). The individual compounds reach the end of the separation column at different times, depending on the strength of their reactions with the stationary phase. The time of the exit of the different compounds from the column, called the retention time, is recorded and the individual molecules can be identified through the accompanying mass spectrometry. The chromatograms were done. But in order to meaningfully interpret them, one should clarify what results were expected. For that, we should take a look at the history of the Carthusian monks in the Grande Chartreuse, who were made famous by their production of Chartreuse Verte. The time period that interests us is around 1903, when the monks produced the liquor in the Fourvoirie Distillery, constructed in 1860, near the main cloister of the Carthusian Order. When the property of the monks was nationalized in 1903, the monks were forced to leave the country. 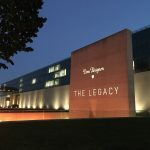 They continued to produce spirits after that in Tarragona, Spain, and were only allowed to return to their main cloister and the bordering Vourvoirie Distillery in 1929. This was finally deserted in 1935 by an earthquake, and a new distillery was established in Voiron near Grenoble, which continues to produce chartreuse liquor today. The point of this little history lesson is that there are differences in flora between France and Spain. The Spanish exile could have led to changes in the Chartreuse recipe, which were never corrected later. New stills could also have had an influence on the taste of the product. Think about producers of whisky or cognac, who use decades-old copper stills with a story behind every dent. This is naturally just guesswork, but wouldn’t it be more extraordinary if the taste of the liquor hadn’t changed over time? Even the 115 years of oxidation are a significant factor in taste. 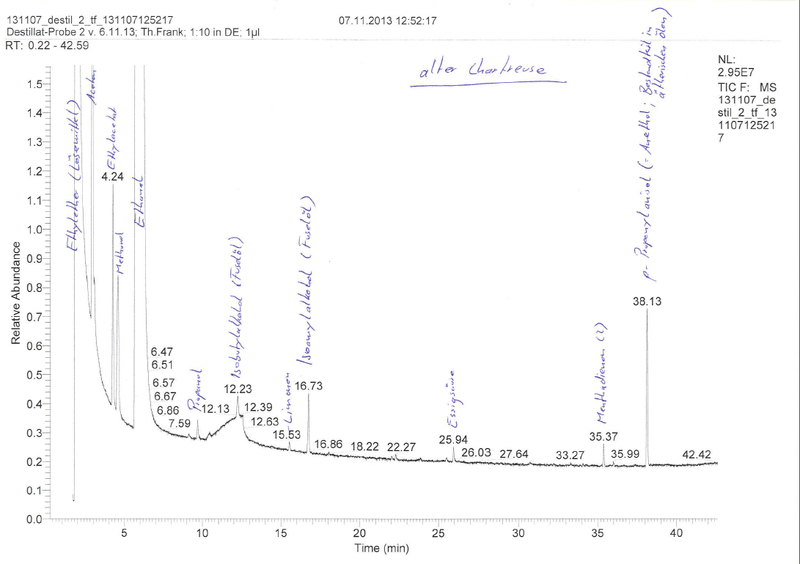 Looking at the analysis of the chromatogram, the individual peaks show semi-quantitatively the concentration of the individual ingredients, and the numbers show the retention time in minutes. 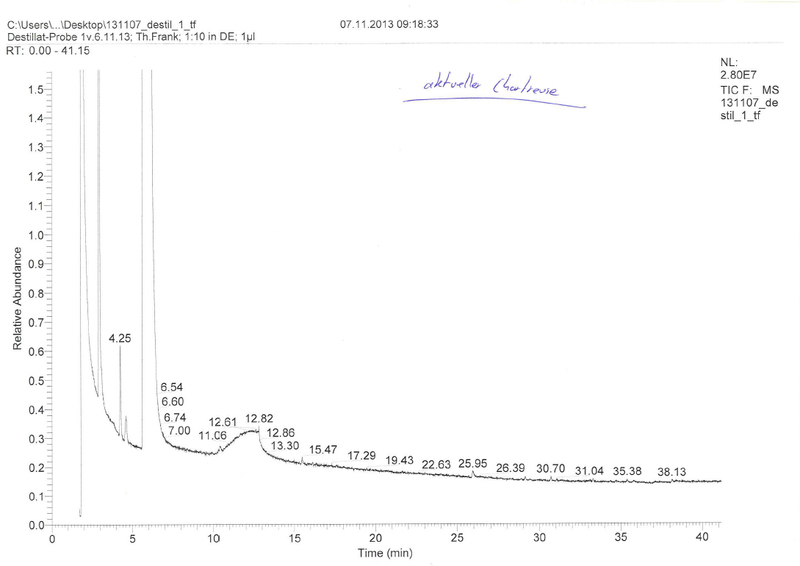 The chromatogram’s results are rather sobering at first. In the current Chartreuse’s GC run, there was almost nothing than ethanol to be seen. 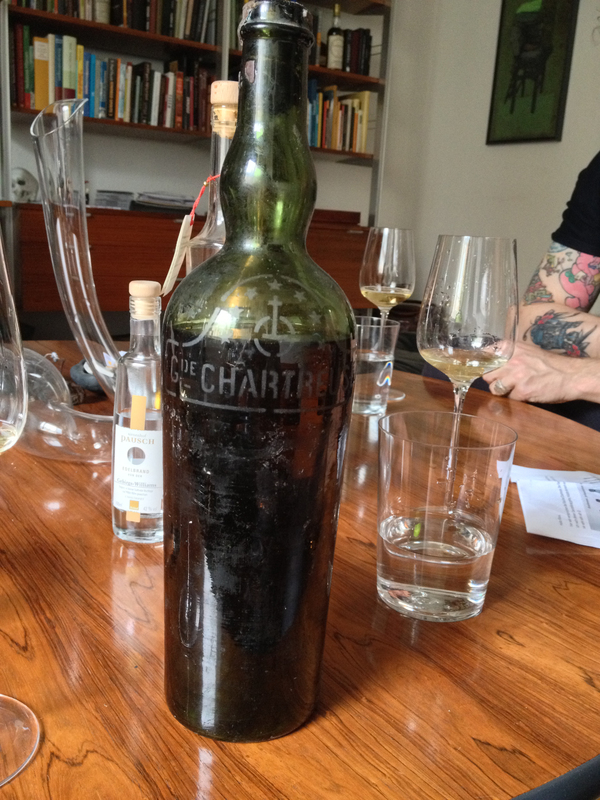 Also the number of peaks on the historical Chartreuse didn’t meet our expectations. Nevertheless a closer analysis of the individual, evaluable contents reveals interesting facts. The following substances describe the peaks of the GC “Historical Chartreuse” from left to right. –> The peak of ethyl acetate can also be found in the current Chartreuse in a lower concentration, (4.25) I suppose that the concentration is lower, because nowadays selected yeast cultures are used, which produce less ethyl acetate. Ethyl acetate can also develop under natural conditions from acetic acid and ethanol, which are also detectable in the sample. 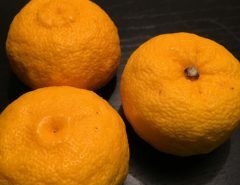 Limonene: Occurs in this example as (D)-(+)-Limonene; contained in the oil of many citrus fruits, also present in dill and coriander oil. 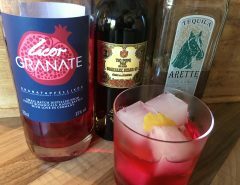 –> The higher alcohols in the tail result in a fruity flavor in moderate concentrations and in higher concentrations in a malty, musty, or even pungent taste. This is desirable by many in the whisky, brandy, and fruit brandy industries, which is why many distillers allow parts of the tail to flow into the final spirit. These tail flavors are considered especially “typical” for in Williamsbrand by some consumers. Acetic acid: is formed from wild yeast or acetic acid bacteria during fermentation. Also forms from plant sap and essential oils. Not unfamiliar; present in modern Chartreuse as well. –> Here it’s difficult to determine whether the presence of menthadienol is the result of a higher earlier limonene content, which has turned into menthadienol over time or if the menthadienol is the result of spearmint. Because spearmint is indigenous to all of central Europe, I would suppose a combination of the two possibilities. p-Propenylanisole: also known as anethole, found predominantly in anise and star anise, some members of the carrot family, like fennel, also contain anethole. –> The anethole content of the historical sample is significantly higher than in the more recent bottling (38.13). This was the most important discovery of the investigation, because it shows that the Chartreuse from the 19th century was much more similar in flavor to absinthe than the modern version. Aside from wormwood, absinthe traditionally contains anise and fennel, which is why higher anethole content is characteristic for absinthe. What can we take away from all this? Naturally, we would like liked clearer results from the analysis and a more exact breakdown of the ingredients. But that would have taken more time and money, and thus we should be satisfied with our results. 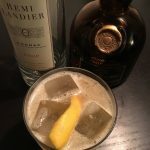 We can definitely conclude that the basic alcohol of Chartreuse was earlier uncleanly produced, and the most important result is the clear difference in anethole content. 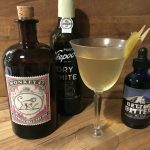 As for the myth, though I don’t want to assume that the modern Chartreuse uses different ingredients from earlier, it can nevertheless be seen that the amount of the herbs in the mixture varies. Even pop culture, which has given Chartreuse great marketing in songs by ZZ Top or films by Quentin Tarantino, alludes to a change in the liqueur’s taste. In Evelyn Waugh’s novel Brideshead Revisited, Anthony Blanche and the narrator Charles Ryder drink Chartreuse after dinner, bringing Anthony to ponder: “Real g-g-green Chartreuse, made before the expulsion of the monks. There are five distinct tastes as it trickles over the tongue. It is like swallowing a sp-spectrum.” Anthony probably wasn’t thinking about our mass spectrum, and that’s a good thing. Because let’s be honest: Even though the taste can be proven to have changed a bit, Chartreuse remains one of the most exciting and versatile liqueurs that there is!